Beautiful catered ski chalet in the lively award winning ski resort of Champagny en Vanoise, Paradiski. It is in a prime position at the front of the village so there are no other chalets to spoil your perfect views and being such a compact resort, everything you could possibly need, including the lifts & pistes are just a 5 mins walk from the chalet. Our experienced chefs and team will spoil you with delicious home cooked meals every day, high quality food that reflects our passion for fresh regional produce and enthusiasm for cooking. For relaxation you have the luxury of our fabulous indoor swimming pool, hot tub & sauna suite. There is plenty of other in-house entertainment, with satellite TV, a large surround sound flat screen TV, and table tennis & pool in the games room. If you fancy a stroll after dinner, the shops, cafes and friendly bars in the village are only a stones throw away, with the main bars often having live bands & DJ's until the early hours. Champagny en Vanoise - Village Resort: Champagny is an authentic mountain village with a character that still reflects its ancient farming origins. Tiny paths link old farms and chalets in a village where traditional Savoie life and modern tourism mesh seamlessly together. The village has a lively atmosphere with shops, bars & restaurants within easy walking distance. At night, Le Timbale, Les Rochers & le Pichouan are the main focal points for drinking and dancing with live bands and D.J.'s. Skiing & Boarding the Paradiski Area which includes both La Plagne and Les Arcs, the two linked together by the biggest cable car in the world, the huge 'Vanoise Express Telecabine'. The whole ski area covers a massive 425km of finely groomed pistes in one of the biggest interlinked ski areas in Europe. With over 180 blue and red runs to cruise down, most skiers and boarders can travel vast distances around the 16 villages. Some very long black runs descend both the Bellecote Glacier (3250m) and the Aiguille Rouge (3225m) both on and off piste. There are also several, into the pretty tree lined runs descending into Vallandry , Plan Peissey and Montchavin. There are also numerous mogul fields in the area and 2 board parks, half pipes and boarder cross runs. Established in 1992, Barrelli Ski, owned by Steve and Emma have been running this our first fully catered chalet since last century! We now run 2 large chalets and 2 smaller apartments nestled here together in a horseshoe type arrangement. After Chalet Marmotte went so well, we added the 14 person Chalet Sapiniere (#3489) in 2001, a 6-8 person Apt. Flocon in 2003 (#439615) and then finally the 4-6 person Apt. Glacon in 2008, which was the last to complete the set! This gave us autonomy over the whole immediate area! This chalet can be taken on its own or in conjunction with our other chalet and apartments, depending on group numbers and levels of privacy or communality required! An indoor swimming pool and spa were built in 2010 adding another dimension to this already fantastic chalet. Our two boys were born in 2005 and 2007 and learnt to ski in Champagny and Les Houches where we also own a fantastic 15 person chalet - Rocky Mountain (#3081). We have lived in various places in the UK and now love living near sandy surfing beaches in beautiful Cornwall! It is in a beautiful situation in a real French village - a fantastic ski resort in its own right with links to practically unlimited skiing and snowboarding. It has a fast, modern lift system and lots of affordable family and beginner passes and various lesson and ski pass options. In essence, we fell in love with Champagny because it has the best of both worlds! It has a fantastic ski area but also a natural charm and ambience which makes it different to many mass marketed ski resorts. It is in a stunning setting with beautiful views. Everyone loves looking out at the cold snowy mountains from the warm jacuzzi and swimming pool! We are a small family business with nearly 30yrs knowledge and experience, so we really feel we have finely honed our product over many years. Our top priority is providing high quality food and service at very affordable prices. There are 7 rooms (including the family room mezzanines) with private showers and basins; 2 separate WC's with basins; 2 extra shower rooms, with toilet and basin, one in sauna suite annexe and one in indoor swimming pool. Exterior hot tub on terrace overlooking meadow and Courchevel Valley. that has shared use with our other on site Chalet Sapiniere. Open until 9pm. The swimming pool, sauna, games room and pool table are shared with its sister chalet (Sapiniere). N.B. No smoking in chalet, ashtrays provided for terrace outside, good chance to look at the fabulous views! We stayed here in a group and the chalet team were happy to cater for our weird dietary needs. The hot tub was refilled daily and the views are fantastic. The pool was good for a dip and the sauna was super. The chalet team catered to our every need and we had a comfy stay. You do have a warm up walk to the lift and the bubble is good to avoid the icy runs home. The recommended hire shop was helpful and well stocked too! Great value for facilities offered. Highly recommend a stay here! Amazing facilities at this relaxed chalet, attentive staff and great food so a great combination! Thanks Barrelli for a fantastic week at Chalet Marmotte. Nik’s food was fantastic and there was lots of it. We particularly loved Joe and his dry sense of humour and laid back approach to hosting us! The chalet is run with a friendly, relaxed atmosphere but the staff are always there to help when needed which suited us great. The chalet is located in a lovely quiet spot, with stunning views but still close to the village and skiing. The walk up to the lift is steep but not long so we power walked up in the morning for a good little warm up! You don't have to do in your ski boots as we collected our equipment from the boot warming racks at the ski hire shop near the lift every morning. We especially loved the pool and hot tub in front of the chalet which both had amazing views across the valley. Steve was really helpful during the booking process and seamlessly organised our airport transfers and we pre booked our ski passes through the resort manager Sarah, so they were waiting for us in the resort but we didn't have to pay until we arrived. All in all, it was a great holiday, we will definitely be back next year! We had a fabulous week in Champangny staying in Chalet Marmotte. The chalet was warm and inviting with plenty of space for the whole group. We were looked after really well by Sarah the resort manager and the whole team making lift passes and ski hire seamless. 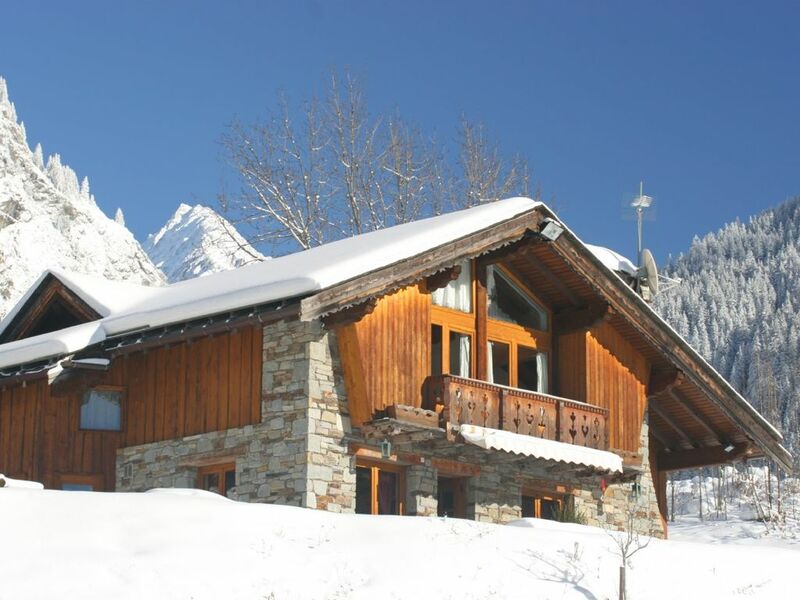 The chalet is conveniently located with just a short walk to ski shop and lifts. Champagny is a lovely small resort with a good selection of bars and shops we were there the first week of the season so it was really quiet which suited us fine. The chalet had everything we needed with comfortable beds, plenty of bathrooms and hot water! The communal area worked well and spent most evenings in here by the fire playing silly games. There was plenty of seating for everyone. The chalet staff were amazing and we were very well looked after, cooked breakfast everyday, lovely cake in the afternoon and a delicious evening meal. A real treat. The other facilities were the icing on the cake, having the pool, hot tubs and games room were an added bonus, but as we were so lucky with the snow we spent most of our time on the slopes. We had one non-skier in the group who really enjoyed her daily dip in the pool with a view. Thank you Barelli Ski for a fantastic week and excellent service. Everything was perfect from the situation of the chalet (little village with stunning views across the valley), bedrooms & general areas (comfortable, stylish and homely), food (varied, plentiful & absolutely delicious), facilities (there is nothing better than soaking your weary muscles in an outdoor hot tub with stunning scenery all around) and the staff (friendly, efficient and so helpful). In fact it was my birthday when we were there & Kiki made me one of the most delicious chocolate birthday cakes I've ever eaten (that washed down with champagne was memorable). It was a fantastic holiday. If you want a piece of heaven - both to stay and ski you needn't look elsewhere. This is the second time I have stayed at Chalet Marmotte and I more than lived up to the reputation I t had gained first time around. Champagy is a small resort - in fact it is more a small Alpine farming village with some skiing facilities - but it is a stunning location and the easy access o the La Plagne ski area gives loads of options for all standards of skier. The chalet it self is well appointed and the facilities are great. It is hard to beat looking down the valley from the hot tub after a hard days skiing. However the staff are the real clinching factor here. They are friendly, make sure the basics (passes, equipment hire, lesson bookings, transfers) are looked after with the minimum of fuss, provide advice and tips about skiing and other local facilities but best of all provide an excellent catering experience. I would happily recommend this chalet to anyone but it would particularly suit a groups of friend or an extended family. Other Activities: Ice Karting, Bob Sleigh, Skidoo Rides. IMPORTANT NOTE - For the remainder of the available dates this for the 2018/2019 Ski Season and for the 2019/2020 Ski Season the PRICES QUOTED ARE NOW PRICES FOR THE WHOLE 19 PERSON CHALET. IT IS A FULLY CATERED PRICE which Includes, breakfasts, afternoon tea and cakes and 3 course evening meals including wine and a cheese board. STAFF have one night off, usually Wednesday. We provide breakfast on that day for you to serve yourself and afternoon cake, you clear up yourselves that day. All the other days, we cook and serve you and clean up for you. Bedding, bed linen, towels & cleaning are included in price. Cots & high chairs provided upon request. WEEKEND/PART WEEKS SOMETIMES AVAILABLE but not usually during peak or high season dates. IF YOU CANCEL YOUR HOLIDAY Cancellations must be advised in writing and signed by the person who signed the booking form or paid the deposit. Cancellations are accepted as from the date written confirmation is received by Barrelli Ski Ltd. If you do cancel, the amount of notice you need to give us before your scheduled departure date and the cancellation charges we apply are as follows: i. More than 56 days....……….loss of the deposit. ii. 28 - 56 days...............………..50% of the holiday balance. iii.14 - 28 days..................……..75% of the holiday balance. iv. Less than 14 days……………..the total holiday cost. See Barrelli Ski website for full terms and conditions .